Seems like we’ve been on the road forever, but it’s really only been about seven weeks. In some ways, I’m ready to be back home, yet the minute we pull into the driveway, I’ll wish we were on the road. Guess that’s why I can’t see myself being a full-time RVer anytime in the near future. So, our last big stop is Ohiopyle State Park, in Ohiopyle, PA. Fun to say, but even more fun as a gorgeous park, with a wonderful campground. 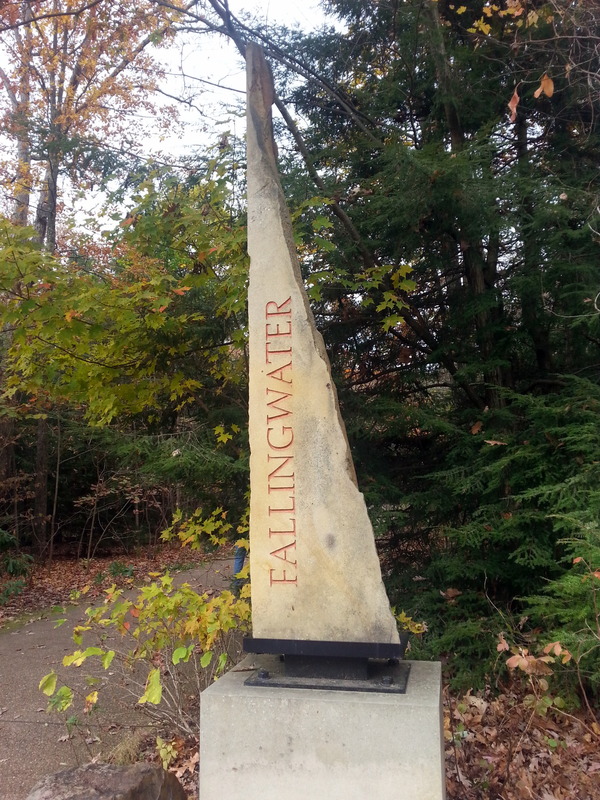 Our main reason for selecting this park was its proximity to Fallingwater, the house generally acknowledged to be Frank Lloyd Wright’s masterwork. So, the first thing we did upon arrival was schedule a tour. Wow – what a fantastically beautiful location for a house. 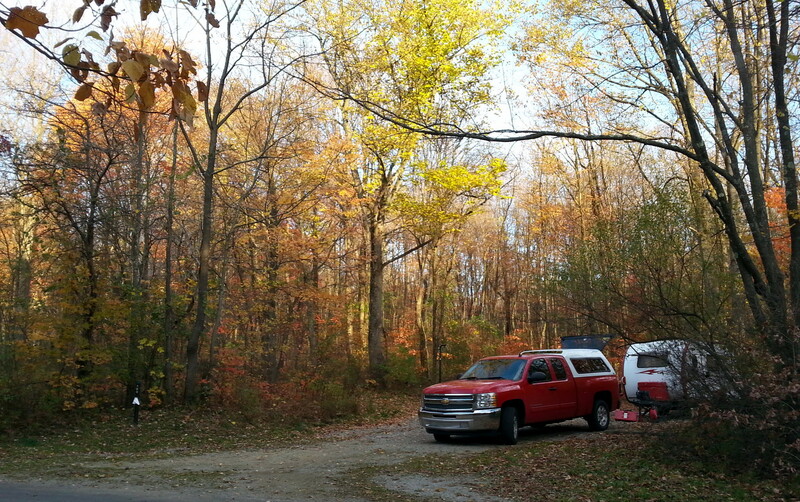 It sure didn’t hurt that we were there on a sparkling fall day, and the surrounding maples were in full color glory. One of the things that makes this house so unique is the placement of the house on the site – instead of building across the stream so that you could see the falls from the house, Wright actually built the house directly over the falls. I’m sure a good argument can be made for either view, but there’s no doubt that Wright probably chose the less common placement. No photos are allowed inside the house on the tour, so you’ll just have to use your imagination. BUT, I do have to say that it would be a tough spot (for me) to live. I kept looking around, wondering where I’d want to curl up with a book to enjoy the magnificent view. There isn’t one stick of comfy furniture in the entire house. (and the house includes all the original furniture, some of which was designed by FLW, as well.) Our tour didn’t include the kitchen, so I’m left to wonder what that may actually look like. Go, if you get the chance. 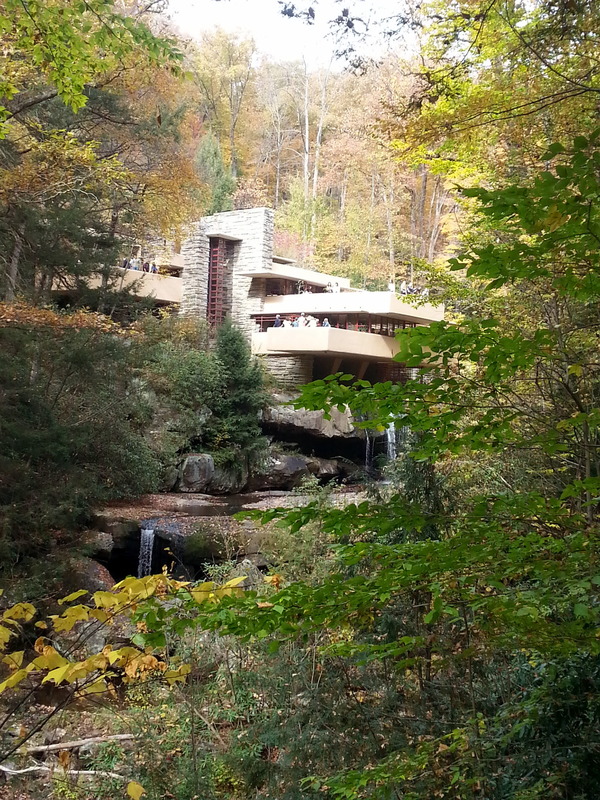 After completing Fallingwater, Wright was besieged with over 400 more projects, only about half of which he managed to complete before his death. We used the rest of our time at Ohiopyle to hike and explore. This little town is an adventurer’s paradise – the center being the Youghegheny River, which roars through town. Looks like a great spot to white water raft. There’s a larger set of falls nearby, Cucumber Falls, but try as I might, I could NOT get a decent photo. The lighting gods were conspiring against me that day. In addition, the Great Allegheny Passage bicycle trail runs through here – a tiny sliver of this 300+ mile trail from Pittsburgh to Washington DC. 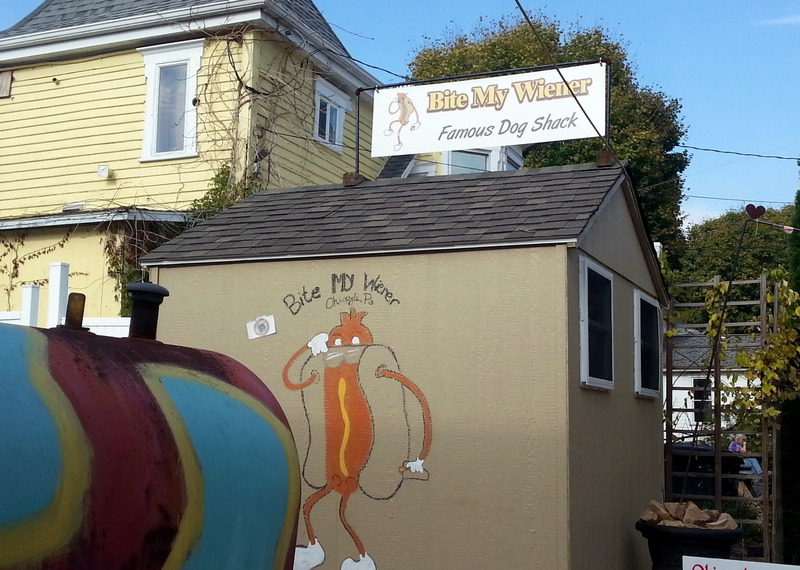 You can probably get a great hotdog at this little spot, but we didn’t sample one. 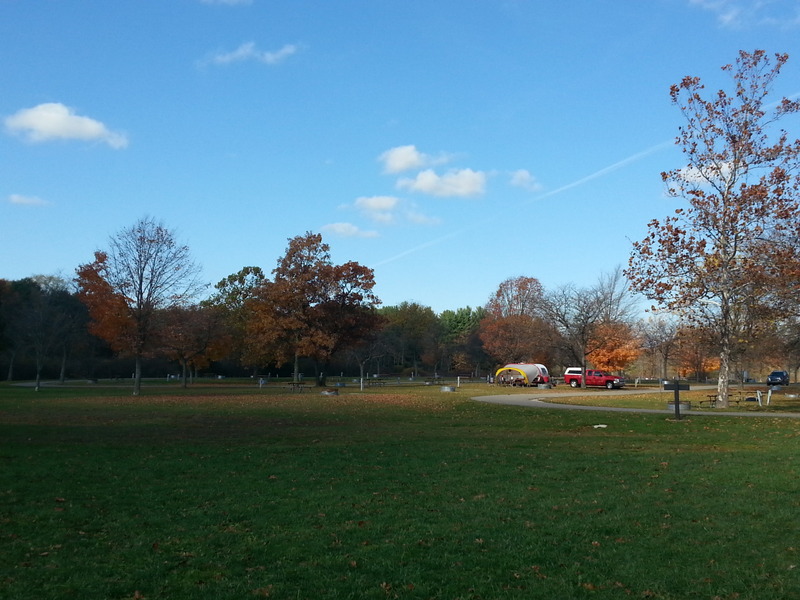 We drove forever the next day to get as far as Findley State Park, in Wellington, OH for a quick overnight. 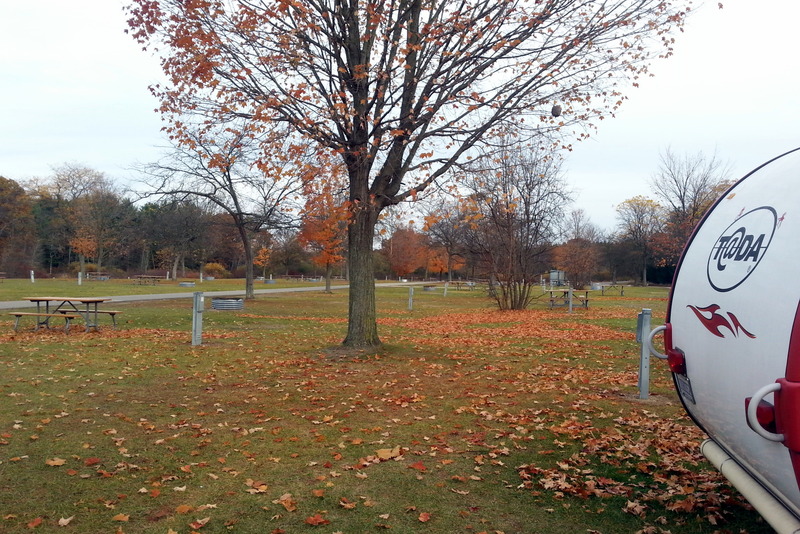 Another beautiful park, with very few inhabitants. We shared a loop with just one other camper, and hardly saw them at all – perhaps the downpour had something to do with that. But, here was the view from out the back of the Fireball. Pay no attention to the little blurry spot in the middle of the photo, I must have jiggled a bit when shooting this panorama. Jezzy liked it here, too. Our last stop was Brighton Recreation Area in Michigan, selected because we needed to camp near Ann Arbor, as we had tickets to hear one of our favorite authors, David Sedaris. The show was fantastic – held in the Michigan Theater, a classic refurbished movie theater in downtown AA. We laughed all the way through – Sedaris is bold and has a self-deprecating manner that doubles his comic presentation. 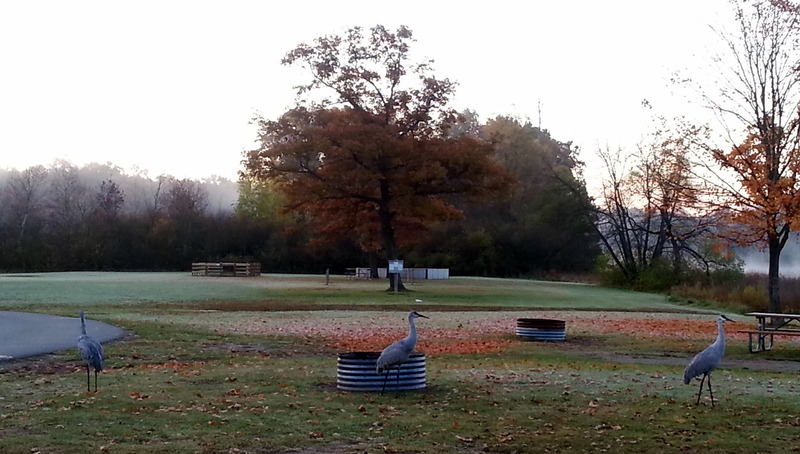 Perhaps the star of this visit though were the three Sandhill Cranes who hung out with us for two days. From early morning to evening, they wandered through the campground, squawking and picking up various tidbits. It was huge entertainment to watch them. Obviously, as it gets later in the year, traffic in the campgrounds thins out. That’s fine with us! Last one to leave, turn out the lights. This entry was posted in attractions, camping, hiking, retirement, road trip, RV life, state parks and tagged Brighton Recreation Area, camping, David Sedaris, Fallingwater, Findley State Park, historic sites, Ohiopyle State Park, sandhill crane, simple camping, T@DA by Judy Crankshaw. Bookmark the permalink. 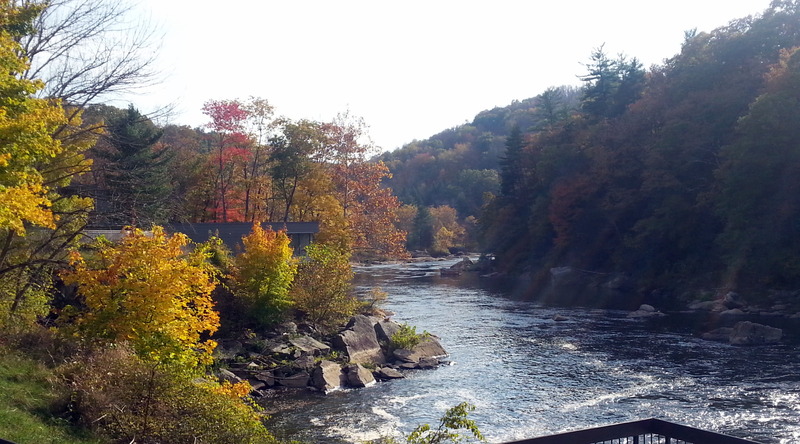 I’m thinking that Ohiopyle, is quite the name. I say that as a former Ohioan; native, actually. I do realize it’s in PA, but the name must have something to do with OH ? Prettier, though. And complete with Sandhills for companionship. What fun for you guys. Well, you shamed me into looking uo the meaning of Ohiopyle. It is derived from a native American term ahi opihele, which means ‘it turns very white’ referring to the frothy water. In any case, it’s a great place to visit. Lots of natural beauty to enjoy. 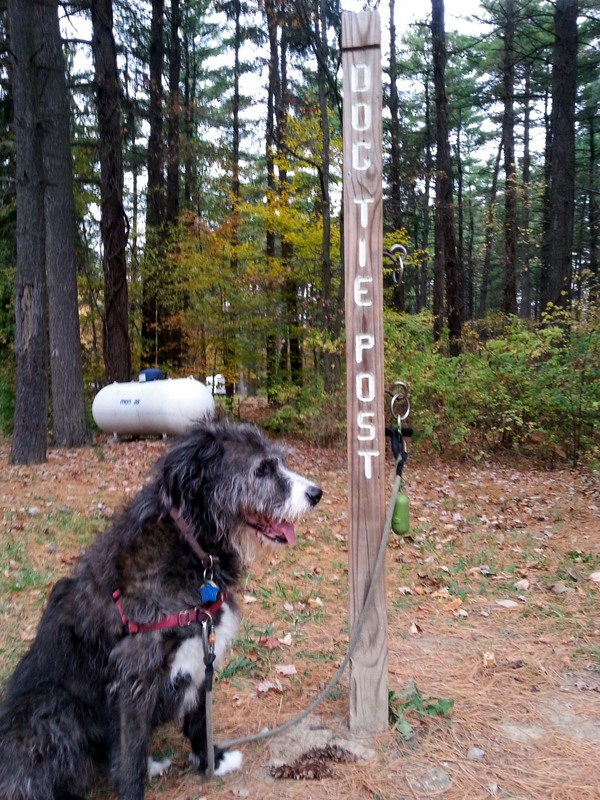 Love seeing all the fall colors – I almost can hear the leaves crunching under your feet! 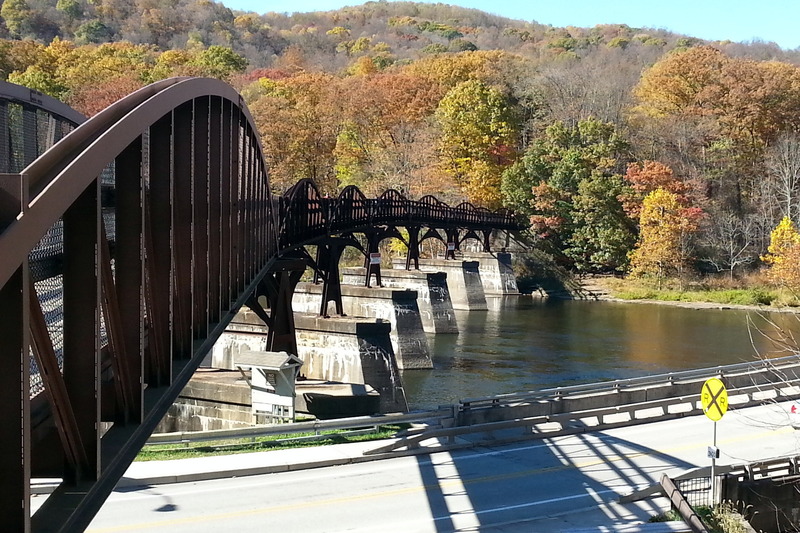 Did you bike the Great Allegheny Passage bicycle trail? I’ve heard wonderful things about it and it is on our future list. Will look forward to the postings from your next trip. We didn’t bike the Trail, although we have friends who have ridden end to end. 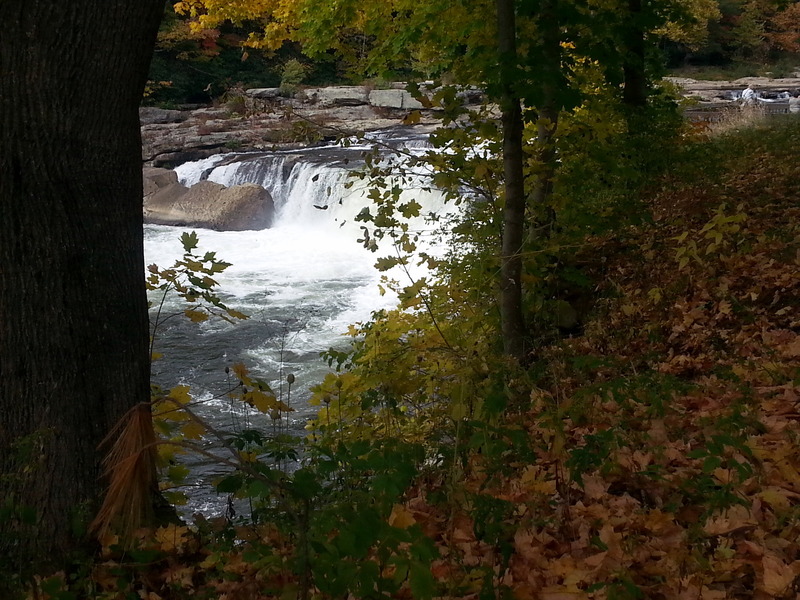 The portion that goes through Ohiopyle is lovely. 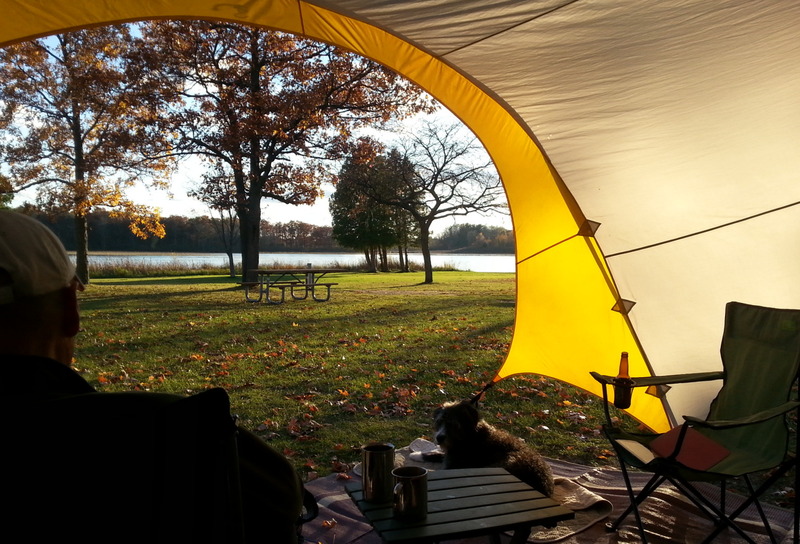 Where are you going to hunker down for the winter? We hope to be back on the road before Christmas, but no firm plans yet. It would be great to bump into you and Glenn out there somewhere. 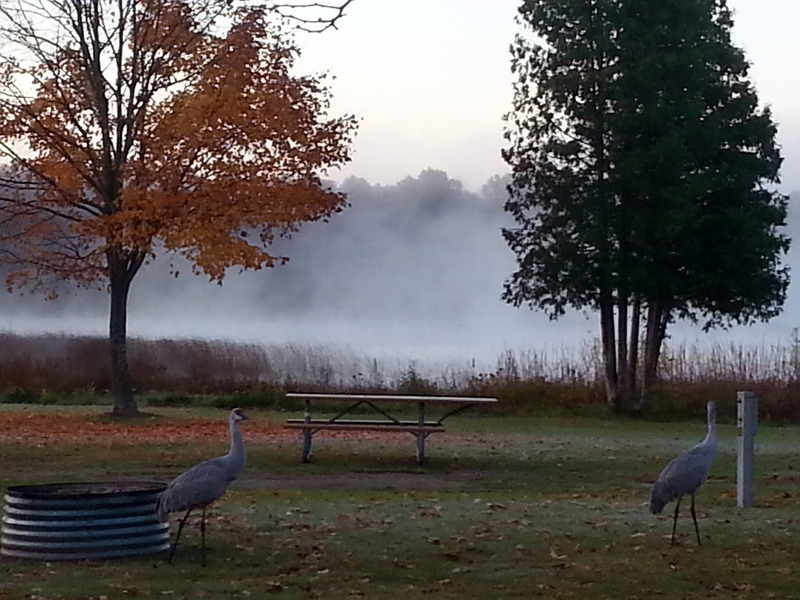 Amazing – the Sandhill Cranes are so beautiful! And Fallingwater has been on my list for many years. I visited his home in Oak Park, outside of Chicago, and remember thinking the same thing about all the uncomfortable furniture! I’d like to visit the Oak Park home. Isn’t that in a whole neighborhood of FLW homes, or am I thinking of somewhere else in the Chicago area? Nope, you are thinking of the right place – I did walk around the neighborhood and see several of the others. They give you a walking map at the FLW house. Those are privately owned though, and just visible from the outside. I would enjoy touring Fallingwater. Looks like you had a wonderful trip, but it is indeed nice to return “home”. I’m still looking for my home base. I miss having one. I could sit and watch cranes all day and am looking forward to my crane encounters this winter. I have this love/hate relationship with coming home. Love being back home with friends, but feel immediately like I’d rather be on the road somewhere. Oh well…. We hope to get back to Whitewater Draw again this year, too. Seeing thousands of cranes certainly was spectacular. I think many of the cranes had already moved on by the time we got there – perhaps we’ll try to get there earlier. The three hanging around our campground could have cared less that we were there. It was entertaining to watch them pecking around for whatever, even jumping into the cold fire rings to search around. It’s sad that this trip is coming to an end, I’ve really enjoyed the journey! My first thought when I saw the photo of the Youghegheny River was “What a great river to kayak!”, but I may be getting too old for that. I’m sure that you two will soon be planning your next trip, if you aren’t already, I’ll be looking forward to it. Weird being home. But since it just seems to want to rain for a few days, I’m happy not to be camping. Already looking forward to being out there again. Thanks for following along with us. You’re coming, we’re going! Day three of our journey to Florida. Jay is happily ensconced in the silver palace sipping a silver bullet and watching the series. Life is good. Once again we thoroughly enjoyed your travelogue. Hurry up and leave again – we want more!!! Thanks Cathie. Tell Jay that the Mets are toast! Maybe next year…..
Are you joining the Coastal Caravan? How long are you going to hang out in Florida? Leaving winter in the rearview mirror is kind of fun. Don’t make the mistake of heading north too early! Beautiful pictures. You’re right about the Youghegheny River being a great whitewater rafting venue. I was the first to fall of the raft, but was saved by some great young guides. It’s gorgeous at every turn and every rapids. My arms reminded me for days about what fun I had. Wish I had gotten to Falling Water, but a ball park was beckoning us. Those sandhill cranes look and sound prehistoric. How did Jezzie like them? Glad you’re getting back home from a great trip safely with few mechanical issues. You got pitched out of the raft?? Scary, I’m sure. Hope you have good memories about it, anyway. Sandhill cranes are fantastic. I had a video with their accompanying cacaphony, but another camper walked up and started to chat, destroying the moment. Cranes aren’t squirrels – Jezzy could care less. Until they grow big furry tails, they are no threat. See you soon. Thanks for going the distance with us. As they say, all good things must come to an end…. You have come full circle from your T@B, where I first met you. Looks interesting – is this the right one?